Today is presented third-generation of Lenovo ThinkPad X1 Carbon, lightest 14-inch ultrabook in the world and the Lenovo ThinkPad 8, top 8-inch tablet that provides a complete PC experience in motion. New X1 Carbon is a beautiful contradiction. Uncompromising lightweight, weighing only 1.27 kg, it is virtually indestructible. The lightest 14-inch Ultrabook in the world has all the strength and endurance necessary for modern professional. The same origin as aircraft and racing cars, X1 Carbon is made of carbon fiber that weighs less than magnesium and aluminum but stronger than both. The reputation of the product X1 is related to expanding the frontiers, and in the design and usability, and the new Lenovo ThinkPad X1 Carbon is no exception. Thanks to technology that is a generation ahead of time, actually takes the way in which users work. New X1 Carbon has Adaptive Keyboard that is dynamically adjusted based on the software or applications used to highlight the most important keys. The new ultrabook also integrates voice and gesture control, allowing users to interact with their PCs in a modern way. 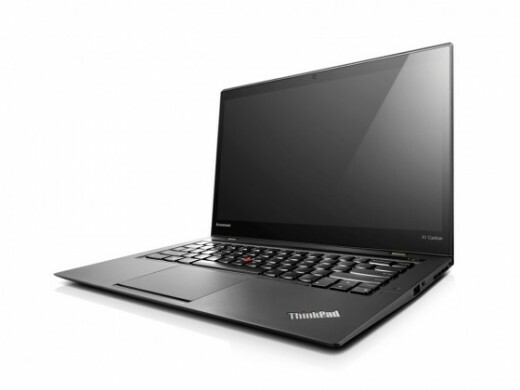 New Lenovo ThinkPad X1 Carbon, also improves the customer experience of seeing and (management) with touch. New Colorburst Display offers sharper, clearer images with higher resolution and better viewing angles for the ultimate viewing experience, whether users watch movie or preparing presentations. For users who are in motion, the new X1 Carbon uses Rapid Charge technology, enabling 80 percent charging in less than an hour. Together with the 9-hour battery life (improvement of more than 70% compared to the last generation), and optional built-in 4G support, the new X1 Carbon provides mobility and connectivity required for users wherever they go. For customers who need enhanced docking experience in a thin and lightweight device, the new X1 Carbon uses ONELINK connector that eliminates the accumulation of cables. This allows users to power, Gigabit Ethernet and dual display support through a single cable via ONELINK ThinkPad docking solutions. New ThinkPad ONELINK Pro Dock combines all the necessary docking features and functions, including power supply, connect with one cable to Lenovo notebook equipped with ONELINK connector. ThinkPad ONELINK Pro Dock includes multiple USB ports, audio and Ethernet connectivity and driver-free dual video support for DisplayPort and DVI on select models. Integrated 90W AC adapter also supplies power to the notebook and supports fast power of other devices such as smartphones.